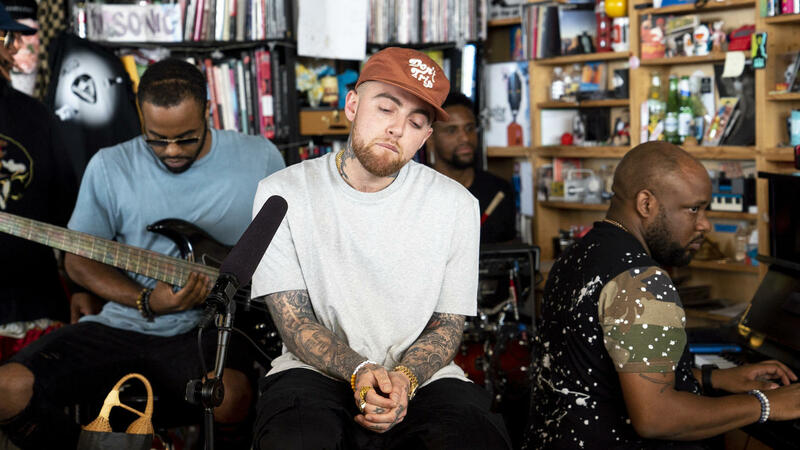 Mac Miller performs a Tiny Desk Concert on Aug. 1, 2018. The NPR Music offices in Washington, D.C., published 127 Tiny Desk concerts this year — 128 if you count the time we thought you'd enjoy watching our piano tuner strut his stuff on April Fools' Day. So narrowing the year down to a Top 10 was impossible, and then it felt terribly wrong to include just 20. So here are 25 of the year's greatest and most surprising Tiny Desk performances: the discoveries who blossomed before our eyes, the veterans who transcended mere victory laps, and just some of the gifted and generous artists who passed through and made the world feel bigger, kinder, more open. In the year we celebrated the Tiny Desk's 10th anniversary, we could have packed this list with nothing but power players, from rock stars (Dave Matthews, St. Vincent) to Latin stars (Cafe Tacvba, Jorge Drexler) to pop stars (Florence + The Machine) to rap stars (Big Boi, Rakim) to bluegrass stars (The Del McCoury Band). Instead, presented chronologically, here's an incomplete but discovery-packed survey of the year in Tiny Desk concerts — music that made us dance, cheer, tear up or otherwise feel profoundly grateful for the opportunity to share and revel in it all. All the way back in January, decorated Russian pianist Daniil Trifonov helped kick off the year with an intense logistical challenge: We had to de-Tiny-fy the space behind Bob Boilen's desk, enough to make room for a 7-foot grand piano. The international star, then 26, more than justified the extra labor, as Trifonov performed dazzling, physically taxing takes on Chopin, as well as Chopin-adjacent compositions by Schumann and Grieg. Amadou Bagayoko and Mariam Doumbia met as children at the Institute for the Young Blind in Mali. They've since married each other and enjoyed careers spanning four decades, eight albums and some of the world's most joyful music. For their Tiny Desk concert, the pair pared their supporting cast down to a simple array: his guitar, her voice, a percussionist, a keyboardist, a backing singer and pure, infectious musical kindness. After more than 50 years, George Clinton still presides over one of the gaudiest, giddiest spectacles in the history of music. His P-Funk All-Stars now span several generations of Funkadelic family — Clinton's grandchildren sing backup, while guitarist Garrett Shider is the son of the late P-Funk legend known as Starchild — but the indelible songs, gigantic musical footprint and commitment to radiant funk remain unchanged. Bob Boilen's desk may be Tiny — that's pretty much canon at this point — but it's big enough, figuratively speaking, to hold the Mothership and harpsichords and brass bands and the freaking Wu-Tang Clan. So what's a little German art song to flesh out the catalog? Accompanied by pianist Reinbert de Leeuw, soprano Barbara Hannigan lends her rich, dreamy, intensely emotional vocals to pieces by Arnold Schoenberg, Alma Mahler and others. A supergroup featuring rapper Common and jazz polymaths Robert Glasper and Karriem Riggins, August Greene was literally born to play the Tiny Desk: The band actually formed in order to play a special 2016 Tiny Desk concert recorded at the White House. Once August Greene finally set foot in NPR's offices, it brought with it a Murderer's Row of decorated guest vocalists: Andra Day, Maimouna Youssef, Samora Pinderhughes and Brandy. Bob Boilen describes Anna Meredith's Tiny Desk concert as "simply the most exhilarating one I've experienced," and he's far less wrong than usual (just kidding, Bob). The British composer and multi-instrumentalist puts on one of the most propulsive and purely entertaining live shows you'll ever witness. Whatever you call it — neo-classical electro-dance-rock? — it's music built to throb in your chest and make you feel alive. There are sentimental favorites, and then there's songwriting all-timer John Prine, whose catalog is checkered with humble folk-rock masterpieces. At the Tiny Desk, Prine spans virtually his entire long career, as he reaches back to 1972's "Souvenirs," unearths a slice of delicious bitterness in 1991's "All the Best," and performs "Summer's End" and "Caravan of Fools" from his first album in 13 years, this year's tremendous The Tree of Forgiveness. Bands don't typically send us riders for Tiny Desk concerts, but the intercontinental pop powerhouse Superorganism did politely request crunchy apples and cans of soda — as instruments, not refreshments. They were far from the only unconventional noisemakers and doodads to populate this wild-eyed feast of playful fun, either, and that's saying nothing of the 20 inflatable whales. Or, you know, the song about prawns. This year's Tiny Desk Contest winner, Naia Izumi, is one of the most dazzling guitarists we've seen, and he's got a voice that conjures memories of Jeff Buckley. Here, Izumi joins the ranks of past Tiny Desk Contest winners Fantastic Negrito (who's since won a Grammy and been nominated for another), Gaelynn Lea (who released a gorgeous album this year) and Tank and the Bangas (who recently signed a major-label deal), as well as one of 2018's most talked-about finalists, Hobo Johnson, whose Tiny Desk Contest entry went viral. The first-ever Broadway musical to play the Tiny Desk, The Band's Visit — starring, among others, Katrina Lenk and Tony Shalhoub — showed up in the morning, performed a few pieces, and zoomed back to New York in time to make a 7 p.m. curtain. A few weeks later, the show won a staggering 10 Tony Awards, including best musical, best director and best score, not to mention lead-acting awards for Lenk and Shalhoub. Coincidence? Everything about Jorja Smith's Tiny Desk debut suggested that we were in for a low-key hang: the languid, minimalist arrangements; the young U.K. singer's relaxed demeanor and smooth delivery; and even the visual atmosphere, which mixed dreamy mood lighting with the dimmer contributions from heavy grey skies outside. But the performance itself was a master class in subtle star power, as the roughly 6.8 million YouTube views (and counting) surely suggest. Khalid wasn't the youngest Tiny Desk performer of 2018 — that'd surely be America's Got Talent winner and Bob Boilen favorite Grace VanderWaal, at 14 — but the pop and R&B singer was only 20 when he turned up to perform a handful of songs he'd written as an angst-ridden high-school SoundCloud star. The five-time Grammy nominee pulls off a remarkable mix here and elsewhere, balancing youthful uncertainty with a showman's burgeoning confidence and undeniable talent. Icelandic composer Ólafur Arnalds specializes in sweet, languid, string-swept soundscapes like "Árbakkinn," which opens this gorgeous set. But Arnalds' Tiny Desk concert is all about invention in more ways than one: A few minutes in, the pianist taps a few keys on an electronic keyboard, only to trigger a flurry of notes on the untouched and exposed pianos behind him. The product of software he and a friend spent two years developing, it's the kind of sound the Tiny Desk is all about: beautiful and stirring, unique to the moment, and an utter surprise. Mac Miller's Tiny Desk concert was meant to be a turning point: the first time he'd perform songs from a new album called Swimming. In a wonderfully good-natured and reflective set, backed at one point by Thundercat, Miller looked forward and backward with no small measure of approachability and charisma. Even after a long run of successes and setbacks, he seemed on the verge. Sadly, this would be one of his final performances: He died a little more than a month later, of a drug overdose at 26. Tower of Power's history is hard to cram into a single paragraph: This year marks the 50th anniversary of the Oakland soul juggernaut, whose horn section has performed with basically everyone, ever. The group has undergone countless lineup changes — it's had something like 60 different members — en route to its current configuration, but it remains the model of precision and force, not to mention pure, funky joy. The easiest time to book major artists at the Tiny Desk — or anywhere — is when they have new projects to promote. But when neo-soul icon Erykah Badu stopped by, she showcased only a pair of jazzy, breezily beautiful classics: "Rimshot" (from 1997's Baduizm) and the epic "Green Eyes" (which closes 2000's Mama's Gun). The crowd was positively electric, simmering with can't-believe-she's-here reverence from the first languid note to the last. Dermot Kennedy was NPR Music's Slingshot artist of the year — a Dublin singer, songwriter and former busker with creative ambition to match his soaring voice. Here, instead of re-creating his densely packed studio recordings or stripping his sound down to its acoustic bones, he hired D.C.'s Howard Gospel Choir and spent a full day workshopping dramatic new arrangements. The choir only enhances his voice's perfectly modulated mix of warmth and intensity. At the Tiny Desk, countertenor Anthony Roth Costanzo matched his eerily high voice to operatic compositions by Philip Glass, David Byrne and George Frideric Handel, accompanied by a bassoon, a flute and a great big harpsichord. So, you know, just another day at the office, where any given day is just as likely to be punctuated by the sound of a sublime opera singer as it is to feature, say, Hanson. Grammy-winner Cécile McLorin Salvant resides at the center of one of the sparest jazz Tiny Desk concerts you'll ever see. Accompanied only by pianist Sullivan Fortner, the singer lets her impeccable, formidable voice pour into every corner of the room, as she commands rapt attention with gripping songs about lost love, unrequited feelings and, in the case of the wrenching traditional murder ballad "Omie Wise," violence against women. Brazilian powerhouse Liniker Barros lives to demolish boundaries: Fusing Brazilian funk, American soul and African rhythms, she and her band glide seamlessly between densely rhythmic show-stoppers and torchy ballads that seethe with aching intensity. Her star power is hard to contain within the confines of the Tiny Desk, but the same would be true of a stage 10 times its size. In 800-plus Tiny Desk concerts, we've seen musicians stir up powerful emotions, but we've never encountered a story quite like this one. After losing his voice to ALS, Bernie Dalton entered this year's Tiny Desk Contest with the help of voice teacher and singer Essence Goldman, who performs his compositions here with Dalton's friends as he watches on a monitor from his hospital bed. It's an extraordinary document, capturing both a gesture of love and a dream fulfilled. Lots of people call boygenius a "supergroup," but we prefer to think of the trio as "The Tiny Desk All-Stars." Julien Baker (making her third appearance at the desk, and second in 2018) joined Lucy Dacus and Phoebe Bridgers for a luminous set. There are only six boygenius songs to choose from — all on the trio's self-titled debut EP — and three of them turn up here, in sparse arrangements that'll make your arm hair stand at attention. Early in the year, Rhye turned up at the Tiny Desk to perform in carefully appointed darkness, complete with a generous shipment of battery-powered candles. So we were well-equipped to improvise when Dirty Projectors showed up after dark on a late-fall afternoon. But the candles just provided the ambiance; the band also brought new, inventive, bracingly intimate ways to reinterpret Dirty Projectors' intricately produced compositions in an acoustic setting. H.E.R. 's status grew throughout 2018 — both at the Tiny Desk and in the world at large. We first saw her as a scene-stealing guest vocalist at Daniel Caesar's Tiny Desk performance of "Best Part," then invited her back for a dedicated showcase of her gifts as a singer, multi-instrumentalist and fast-rising R&B star. By the time we got around to publishing her performance, H.E.R. had received her highest-profile endorsement yet: five Grammy nominations for 2019, including nods for Best New Artist and Album of the Year.